Americans love sports. From the NFL to the WNBA, the business of sports memorabilia is booming. But we’re not just spectators. We love to play sports too. And, according to science, we have good reason. Health benefits from playing sports in childhood last well into adulthood. So many homes and apartments are populated by old and new basketballs, scuffed up baseballs, deflategate footballs, tarred bats, and other sporting equipment. 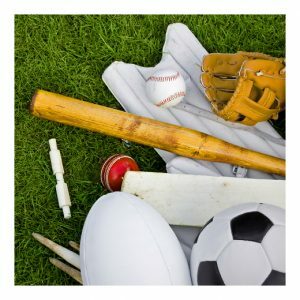 Here are some tips for storing your sports equipment. The very first thing you should do is take notice of all the sporting equipment you own. How much time has gone by since your last batting practice? Do you see one in the foreseeable future? If not, maybe the bat you taped together should sit in storage anymore. Toss what you won’t use again, and toss what is useless. It’s time to cause your own Deflategate. Deflate everything that has air in it. Then put it all in a box. Also, if you don’t have one, it’s a good time to purchase a pump. Store it with your deflateables. Tennis racquets require a different type of storage than basketballs. Be sure when you bring your sporting equipment to storage that you have the correct insulators and the correct unit type to store everything. Sports is a big part of life. When you store your sporting equipment, school yourself on the details of storing it all.